Holland Track and Kalgoorlie with Adam, originally uploaded by y_kiwi. Given the strength of the sidewalls – what better option than to fill the tire full of foamy stuff, ignore the fact that most of it came out of the now wrecked tube and ride home? 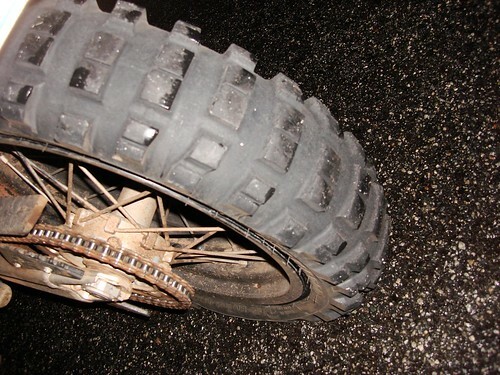 It made it – this is the tire after I got home. What the photo doesn’t portray is the hot and runny tire smell. I was glad for the cooling effects of the rain on the tire though. All in all an excellent long weekend, and lots of things to ponder and prepare for when I embark on a rather longer trip in a week or three.